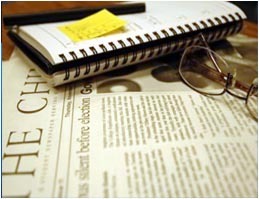 The examination for the Master's Degrees are conducted twice a year in the last week of June and December every year. The examinations are held at Anand, Agartala, Aizawl, Allahabad, Ahmedabad, Aurangabad, Agra, Alwar, Ajmer, Ambala, Amritsar, Arrah, Bareilly, Bangalore, Baroda, Betul, Bathinda, Bhagalpur, Bhopal, Bhubaneshwar, Bhilai, Bilaspur, Bokaro, Bulandshahr, Buxar, Calicut, Chandigarh, Chandrapur, Chhindwara, Chennai, Dehradun, Delhi, Dimapur, Dewas, Etawah, Fatehpur, Gandhi Nagar, Gangtok, Goa, Gorakhpur, Guna, Gwalior, Guwahati, Haridwar, Hisar, Hanumangarh, Hyderabad, Hubli, Imphal, Indore, Itanagar, Jammu, Jaipur, Jamshedpur, Jind, Jabalpur, Jodhpur, Jhansi, Jhajjar, Ludhiana, Kaithal, Karnal, Kargil, Kohima, Kashiram Nagar, Kolkata, Kollam, Kota, Korba, Kanpur, Kolar, Kathmandu, Kolhapur, Khandwa, Lucknow, Mandi, Meerut, Mirzapur, Mohindergarh, Mumbai, Muzaffarnagar, Muzaffarpur, Motihari, Nagpur, Narwana, Nasik, Patiala, Panipat, Pathankot, Port Blair, Patna, Pune, Ranchi, Raipur, Ratlam, Rewa, Rohtak, Roorkee, Rewari, Rishikesh, Sagar, Samastipur, Shillong, Shimla, Sikar, Sonebhadra, Sri Ganganagar, Srinagar, Sagar, Sirsa, Surat, Trivandum, Tikamgarh, Udaipur, Udhampur, Varanasi, Wokha. (More Centres may be opened). All admitted students are required to submit assignments in the form of Mini Project Reports on each of the subjects being studied by them and for getting them evaluated. 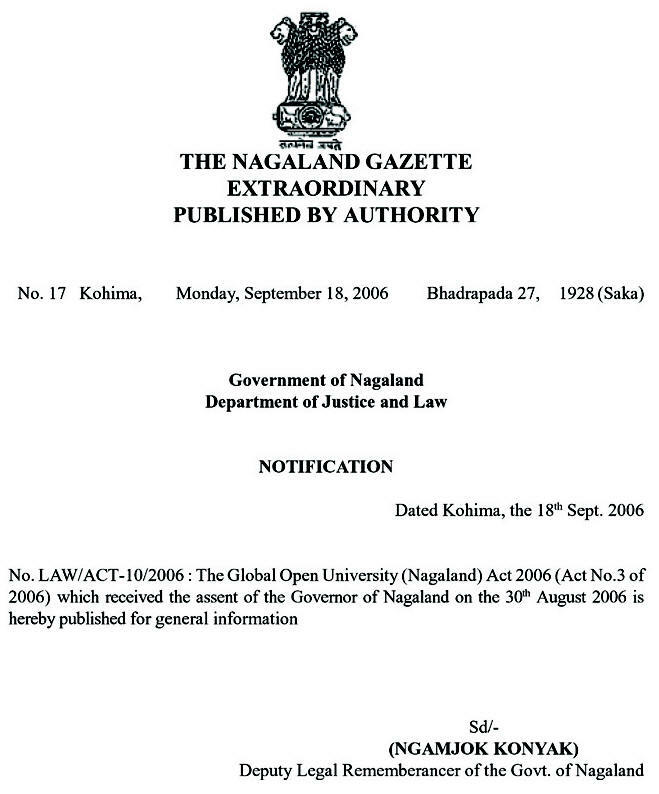 The Global Open University, Nagaland has decided to update its curriculum on a continuing basis. 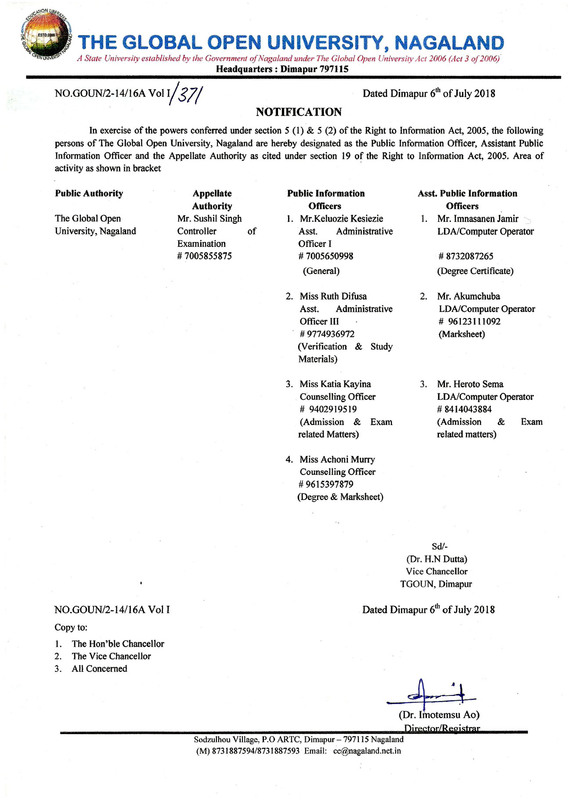 The subjects mentioned for different semesters in the following pages may be changed should these be deemed necessary for enabling the students to acquire necessary skills in the new and emerging areas of Journalism and Mass Comm.